CBT has become a very popular therapy, and is widely available via the NHS. It is well-supported by research and lends itself very well to short-term, focused therapy. As such, it is used extensively in the NHS to help patients with anxiety, depression and other psychological problems. One of the main ideas in CBT is that it is the way we think and behave that determines how we feel. So, if we want to feel differently - be less anxious or sad, for example - then we need to challenge our negative thinking and change our unhelpful behaviour. CBT places great emphasis on a rational and scientific approach to help us to make good decisions. CBT is very good at mapping out how a problem has arisen, how it gets maintained or gets worse, and how we may be able to move forward with changes. CBT has some powerful tools and techniques. The cognitive side is around challenging and re-structuring negative thinking. The behavioural side looks at systematic ways of changing our unhelpful behavioural patterns. It is a more structured way of working, which some people find very helpful. I am also trained in Trauma-focused CBT, which is a NICE-recommended treatment for PTSD. 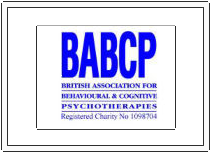 I am an accredited Cognitive Behavioural Therapist, which involves extensive training and experience of CBT. I have also worked as a CBT therapist within an NHS service.